Constants for single-click actions on objects. Definition at line 39 of file llclickaction.h. Referenced by LLToolPie::handleHover(), LLToolPie::handleMouseUp(), LLPanelPermissions::onCommitClickAction(), LLToolPie::pickAndShowMenu(), LLToolPie::selectionPropertiesReceived(), and LLPanelPermissions::setAllSaleInfo(). Definition at line 36 of file llclickaction.h. 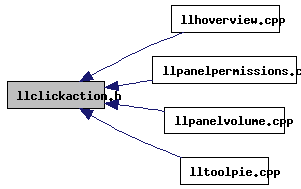 Referenced by LLHoverView::draw(), final_click_action(), LLToolPie::handleMouseUp(), and LLPanelVolume::sendIsFlexible(). Definition at line 41 of file llclickaction.h. Referenced by LLToolPie::handleHover(), LLToolPie::handleMouseUp(), LLToolPie::pickAndShowMenu(), and LLToolPie::selectionPropertiesReceived(). Definition at line 40 of file llclickaction.h. Referenced by LLToolPie::handleHover(), LLToolPie::handleMouseUp(), LLPanelPermissions::onCommitClickAction(), LLToolPie::pickAndShowMenu(), and LLToolPie::selectionPropertiesReceived(). Definition at line 38 of file llclickaction.h. Referenced by LLToolPie::handleHover(), LLToolPie::pickAndShowMenu(), and LLPanelVolume::sendIsFlexible(). Definition at line 37 of file llclickaction.h. Referenced by final_click_action(), LLToolPie::pickAndShowMenu(), and LLPanelPermissions::setAllSaleInfo().